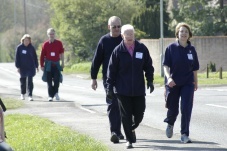 2012 will be the 50th Radley Good Friday Walk. For those who’d like a slightly shorter walk, there is the Half Walk from Radley to Red Bridge on the outskirts of Oxford (walkers are given a different coloured number on registration and turn for home at the drinks station outside Go Camping). This much newer event, which began in 2008, is intended to allow the younger element to progress from the Triangle and for older entrants to wind down from the long walk.For children and the less energetic, the Radley Triangle offers a gentler alternative. This shorter walk goes from the starting point at the pub around Lower Radley and back. This option was first offered in 2003 and has proved very popular. Children under 12 must be accompanied by an adult. Refreshments are on offer throughout the day for participants and supporters. During the event, the facilities of the Bowyer Arms are made available by Greene King and the pub landlord. The walk is organised by Carina Coppock and Tracie Gunert. All proceeds from the day go to a local charity.